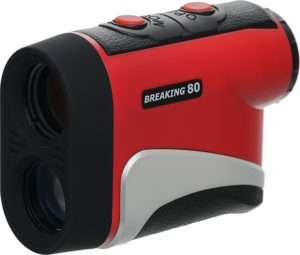 A solid mid-range product that should fit most people’s needs perfectly fine, the Breaking 80 Golf Rangefinder offers a lot for its price. The laser rangefinder works in an intuitive automatic mode that provides you with up-to-date data, and allows you to improve your game with minimal effort. It doesn’t take too long to get used to its interface, and the quality of the optics and actual rangefinding components is good enough to take a few strokes off most people’s games. Operating the rangefinder is easy – in the default mode, you just have to target a few large objects near the flag, after which you would move the rangefinder over to the flag itself. This will give you a precise distance reading, allowing you to calculate your shot down to the last centimeter. Of course, this is not something everyone will benefit from in their everyday play, but those who know how to estimate their shot strength based on the current distance will be able to get ahead in the game very easily. Users have reported that the distance measurement capabilities of the device usually exceed those of most consumer-grade GPS devices in the typical conditions one would play in, but of course you’re always free to combine multiple devices for the best possible results. One of the best features of the Breaking 80 Golf Rangefinder is that it comes with a lifetime warranty, and all it takes is one quick registration after purchasing the product to ensure that you’re covered forever. Not that you should need it in most cases though – the rangefinder is durable enough that most people likely won’t be able to break it through regular playing. If you play in more rugged conditions or you tend to be more aggressive in your game though, that’s a different story. But in those cases, you’ll at least know you’re completely covered by the manufacturer.